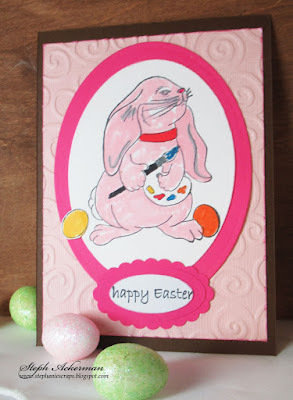 Hi everyone, Steph Ackerman here again today and I've used some great stamps from the store to create my card. I created a card from brown cardstock and added an embossed panel of pink on top. The Bunny Artist was colored with Memento Markers and then die cut with Spellbinders dies, cutting around the Easter Egg. I matted the bunny with dark pink cardstock and added it to the card. 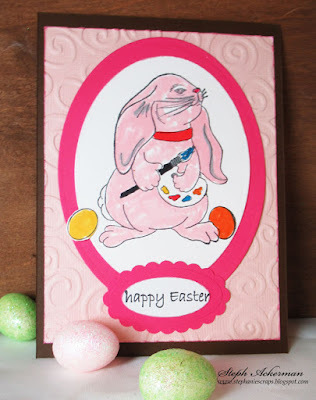 Happy Easter is from Sentiments 1. 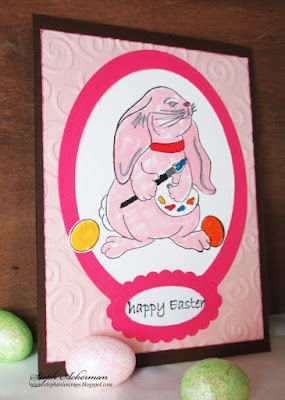 I used an oval punch and adhered it to a larger dark pink scalloped oval.